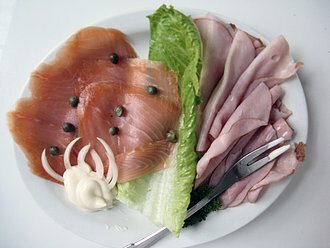 ' Bon appétit, guten Appetit, buen provecho....enjoy ! ' , Isolde. 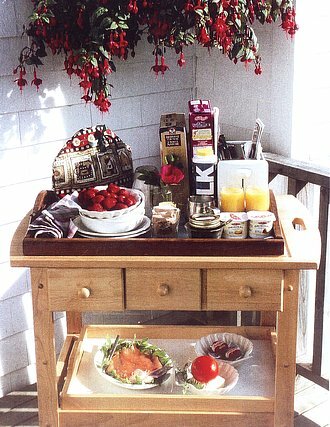 This is the same delicious breakfast that the guest self-serves from the trolley: fresh , local in-season strawberries; 100 gm thinly sliced Mersey Point Fish smoked salmon or sliced Black Forest ham; multigrain bagels; juice is pomegranate / elderberry ; yogurt Balkan style; choice of 2 cereals - Raisin Bran / Harvest Crunch ; beverages shown in the photo - hot chocolate with marshmallows; coffee and/or tea ; home-made black currant jelly. Components subject to availabilty. Your private deck overlooks Liverpool Bay and Coffin Island. Orientation is SE...so the morning sunlight floods over the deck. One can easily observe the blue jays,purple finches,cardinals, goldfinches, and hummingbirds on the nearby feeders. 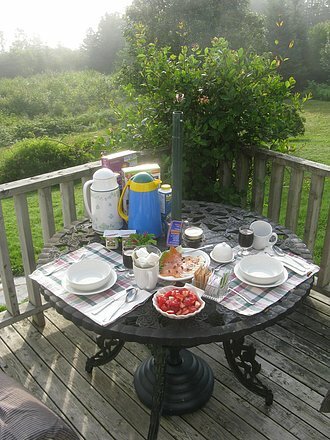 On each breakfast trolley is 125 ml.jar of Isolde's self-made gourmet Black Currant Jelly from unsprayed currant bushes on the GGH premises.The berries are picked in late July and sterile juice extracted with her German-made stainless steamer-juicer.You can't even buy this jelly from your local grocer! What could taste better ? 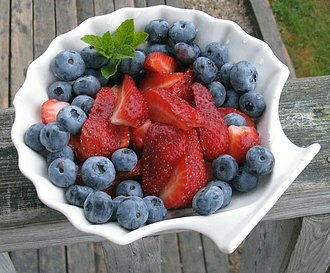 This features in-season Nova Scotia strawberries and high-bush blueberries or the intensely flavourful hand-picked wild variety myrtille , topped with Moroccan mint from our herb garden. 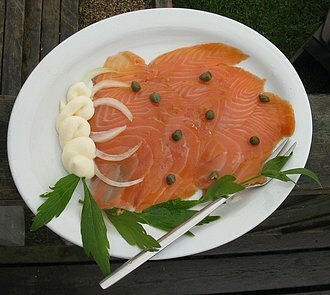 Crafted locally by Mersey Point Fish Products from their Dutch family's licensed smokehouse, 100 gms thinly sliced smoked salmon garished with capers,freshly clipped garden dill, onions, mayonnaise on a bed of our fresh Lovage. Enjoy with right-from-the-oven warm multigrain baguette and/or bagels.